Are you longing to change your life? To detoxify your body, to be renewed and replenished, but feel as if you don't have the time or the money? Now you don't have to go to a posh spa to rejuvenate -- you can restore yourself in your own home in just three days. 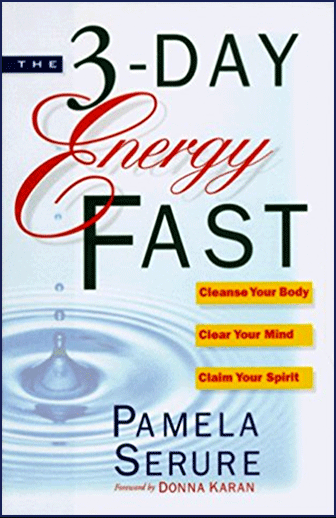 Pamela Serure's The 3-Day Energy Fast makes available for the first time her legendary ultimate life detox program -- an integrated body, mind and spirit health plan that will help you get your juices flowing and feel physically renewed and spiritually replenished. Every one of us needs cleansing because we live in a world that is becoming increasingly toxic -- environmentally, chemically, physically, emotionally and spiritually. From the polluted air we breathe to the chemically laced food we eat, from the unfiltered water we drink to the negative relationships we tolerate, we are filled with toxins, but you can change the quality of your health. You can detoxify your body, and you can start doing it today. With The 3-Day Energy Fast you can clean yourself out, top to bottom -- mind, body and spirit. Say good-bye to all the chemicals and toxins trapped in your body, the negative ideas that are lodged in your head and the destructive behavior patterns that are ingrained in your psyche. Serure's program allows you to break with the past and create new beginnings. She offers an easy-to-follow three-part approach: "The Fast" shows how to make simple combinations of fruit and vegetable juices, along with easy vegetable mineral broths for the evenings; "Meditating and Breathing" offers exercises specifically oriented to the process of cleaning out emotional, spiritual and physical toxins, finding quick energy, calming down, balancing the body and spirit and helping to support fasting and healing; and "Creating Ritual and Discipline in Your Life" teaches you how to set up your own "sacred space" to which you can surrender your fears and dreams, and to schedule daily meditation and journal writing. By following this extraordinary plan, you will experience a new dimension of health, vitality, beauty and clarity, including a healthy body, clearer skin, brighter eyes, weight loss, enhanced energy, minimal anxiety and maximum creativity. The 3-Day Energy Fast lights the path to an approach to food, wellness and spirituality that can last a lifetime. PAMELA SERURE left her highly successful career as a product development and marketing executive in 1991 to concentrate full-time on creating a program that offered a new approach to healing. Combining her more than 20 years of intensive study in metaphysics with a lifetime devoted to learning more about health and food, she has dedicated herself to teaching people the benefits of transforming their lives through fasting, detox and spiritual renewal. She lives in Bridgehampton, New York.